Shankhahuli, Salab Misri, Asraul, Gokhru, Juft Baloot, Lodh, Mochras, Tukhm Konch, Talmakhana, Kushta Mirgang, Kushta Qalai. 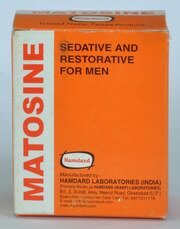 It is used to treat general debility and weakness in men. It acts as an aphrodisiac. 2 Capsules twice-thrice a day with milk or water. 5 strips x 10 capsules. it is very helpfull to restore maintain enerzy level and increase the immunity .its provides strongness also. it is very helpfull to restore maintain enerzy level and inc ..